Natale con i tuoi, Pasqua con chi vuoi. “Christmas with your family and Easter with whomever,” goes the saying in Italian. Well, as I sit here typing this post, my house is absolutely quiet with everyone else napping and I am not feeling bad at all about my selfish afternoon snack, alone with my colomba di pasqua. 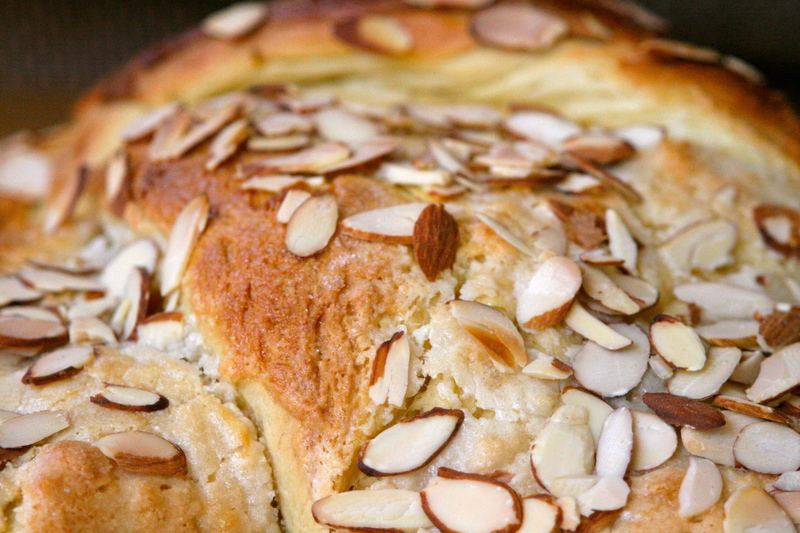 The colomba di pasqua, or “Easter dove” is classic Italian bread, usually purchased at a favorite bakery. To be perfectly honest, I am not a huge fan of the quintessential colomba recipe. It is usually a little too boozy for my taste in breads. This colomba, on the other hand, is eggy and rich, much like brioche, with just enough Meyer lemon zest to heighten the almond flavors without becoming a citrusy bread. It is a perfect accompaniment to Easter brunch or dinner or you can serve it as dessert, if you choose to add the frangipane-like topping with sliced almonds. Like many breads, you can actually do everything the day before and let it wait in the fridge the night before so you do not have to craze about on the day you bake it. You mix it together in the mixer, let it do its first rise, shape the dough, and cover it with the egg white-almond paste and leave it in the fridge. About an hour and a half before you are ready to bake the bread, take it out, let it finish rising while the oven preheats, and cook it. If you like to knead by hand, feel free. The dough is silky and has a beautiful texture that is a pleasure to knead. I do the final knead by hand before shaping the dough. 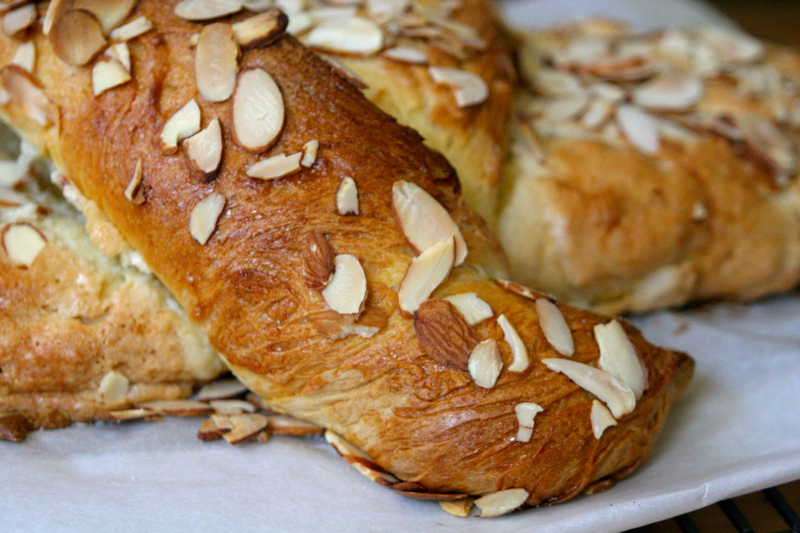 Also, if you want the bread to be a little less sweet, you can skip the almond paste mixture and simply glaze it with egg white, sugar, and the almonds. So go spend Easter with whomever you please and bring this bread (or pull off warm pieces just for yourself). I’ll be thinking of my newborn sweet niece who, though I will not see this weekend, I am anxious to meet in a couple of weeks. Happy Easter and Passover folks! 1. In bowl of standing mixer (such as a Kitchen Aid) mix together the 3 tablespoons warm water, brown sugar or honey, and the yeast. Let foam up for a couple of minutes while you continue. 2. Head milk until it just begins to boil. Remove from heat and add the butter, lemon zest, sugar (or honey), and vanilla extract, stirring until the butter is completely melted. When lukewarm (not hot or it will kill the yeast!! ), pour into the yeast mixture in the bowl of the mixer along with the 6 egg yolks and 1 1/2 teaspoons salt and mix on low with dough hook. 3. Add 4 cups of flour, keeping low-speed. Once all the dough is moistened, turn the speed to medium (about 6 on the Kitchen Aid) until silky and smooth (about 6 minutes). Let it “knead” for at least three minutes past the point where all the dough pulls away from the bowl. If the dough does not pull away from the bowl, add flour, 1 tablespoon at a time until it pulls away and becomes a ball. 5. On a lightly floured, smooth surface, punch down the dough and knead until smooth (you can also do in the mixer if you are short on time, about 3 minutes or 5 minutes by hand). Separate into two equal sized portions and shape into a dove. 6. Cover a large baking sheet (minimum 13 x 15 inches) with parchment or butter it well. 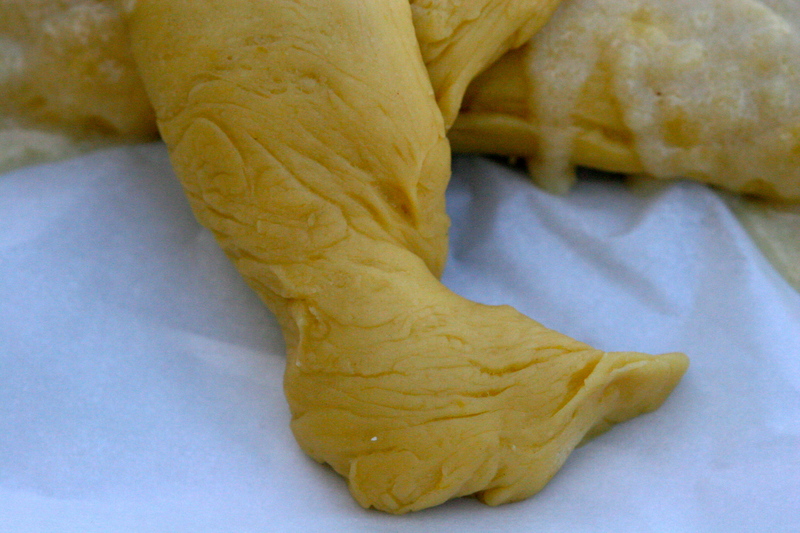 With a rolling-pin, roll out one piece of dough (the wings) into an oval, about 5×10 or 5×11 inches. Lay this on the parchment-lined sheet. Take the other piece of dough and roll out to a triangle with a 5 inch base and two 12 inch long sides. Place this on top of the wings, like a cross. The 5 inch base is the tail. Take the long top and twist it once. This will be the body. Pinch about 2 or 3 inches from the top to make the neck. Then, at the very top of the head, pinch ad shape it so that your dove has a beak. With an old school razor or a very quick sharp knife, score the tail and wings so it looks like feathers. 7. If using the almond paste mixture, whisk the 1/3 cup almond paste and 1 white together and spread on the wings and tail. Cover loosely with plastic wrap and let rise to almost double (but not quite) or put in the fridge overnight. Take out of the fridge about 2 hours before you want to bake it. 8. Preheat the oven to 325 F degrees. Once risen, brush the whole dove with the last egg white and sprinkle with the remaining sugar and almonds. Bake for about 40-50 minutes or until a toothpick/skewer comes out clean. Let rest on a baking rack and serve warm or room temperature. Leftovers make crazy delicious toast. 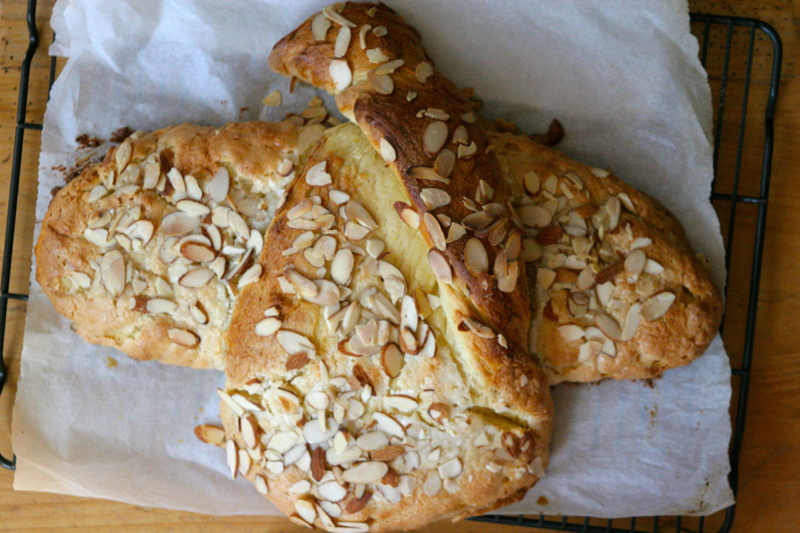 This entry was posted in Almonds, Breads, Dessert, Recipes for Egg Yolks and tagged almond Italian bread, almond paste bread, colomba di pasqua, Easter bread, Italian Easter dove bread, recipe to use egg yolks. Bookmark the permalink.